When you love to drink a good espresso, you like to know that you can have one when you feel like it. However, the sad truth is that sometimes, you don’t have an espresso machine near you and you just can’t go to a coffee shop. So, what can you do? With this in mind, today, we decided to show you how to make espresso without machine. Yes, you read it right, You are about to learn on how to make espresso without machine. And we are not only showing you one way but two different ways so that you can always drink an espresso. While the AeroPress is usually thought to make a double shot of espresso, all you need to do to get one shot is to cut in half the amounts of water and coffee. 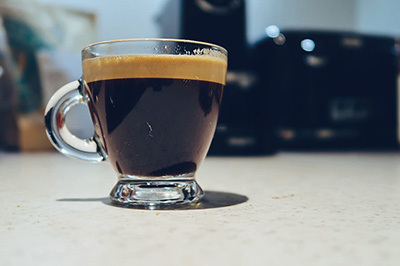 In order to prepare an espresso using AeroPress, you’re going to need an AeroPress, a burr coffee grinder, a scale or a tablespoon to measure the coffee, and freshly roasted coffee beans. 1. Heat 1 cup of water (234ml or 8 oz) to 85ºC (185ºF). 2. Use the grinder to grind your coffee beans. Make sure that you use a fine consistency up until you get 2 tablespoons of ground coffee (28.3g or 1 oz). 3. Add the filter to the AeroPress and rinse it with some hot water. 4. Place the drain cap on the AeroPress and just put your coffee mug in place. 5. Pour the coffee grounds into the AeroPress and tamp them down. 6. 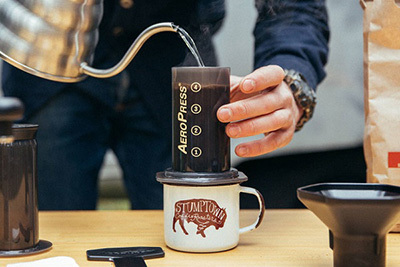 Add half a cup (120ml or 4 fl oz) of heated water into the AeroPress and stir. 7. Wait about 30 seconds and plunge until it is fully depressed. 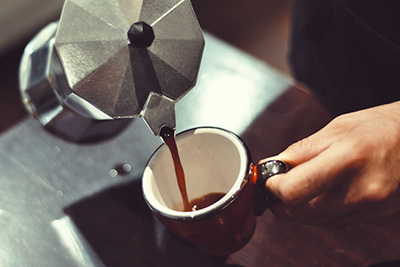 Discover how to make coffee using a percolator. In order to prepare an espresso using a Moka Pot, you will need a Moka pot, a burr coffee grinder, a scale or tablespoon to measure the coffee, a stovetop kettle, a small spoon for stirring, and freshly roasted coffee beans. 1. The first thing that you need to do is to grind your coffee to a very fine texture using the grinder. Measure 4 to 4½ teaspoons (.71-.78 oz. or 20-22 grams) of coffee. 2. 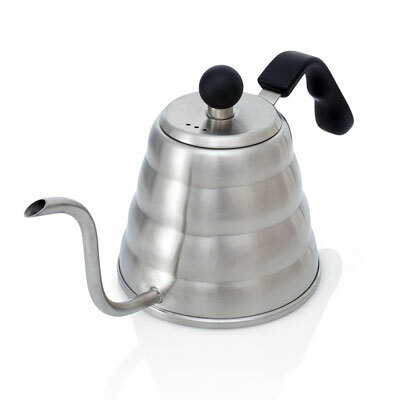 Grab your Moka pot and fill it with water until the fill line. 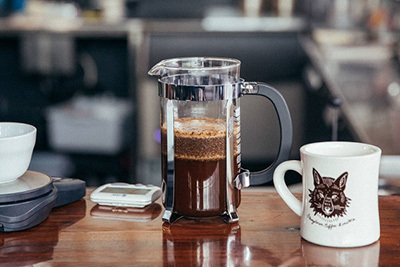 These are the top electric coffee percolators. 3. Add the ground coffee to the filter basket and then attach the spouted top of the Moka pot. 4. Put the Moka pot on the stovetop at medium heat. 5. When you hear a hissing sound, you know it is time to check for the hazel brown foam that will appear. This means that your coffee is about to be done. 6. When the Moka top is full of coffee, just remove it from the burner. 7. Stir the top chamber of the Moka pot with the spoon and serve.